Roccat Vulcan 100 AIMO Review | Nerd Much? There are a few brands in the PC peripherals space that have cemented themselves as leaders in quality. One of those brands is Roccat, and if you’ve been following Nerd Much? for a while, you should know that we’ve had nothing but good things to say about their stuff. In fact, I’m still using the Roccat Leadr mouse on a daily basis for all of my computing and gaming needs. We’ve been kicking the tires and clacking away at the new Roccat Vulcan 100 AIMO keyboard for the past couple of weeks, and it looks like it’s going to be our main gaming keyboard from now on, as well. 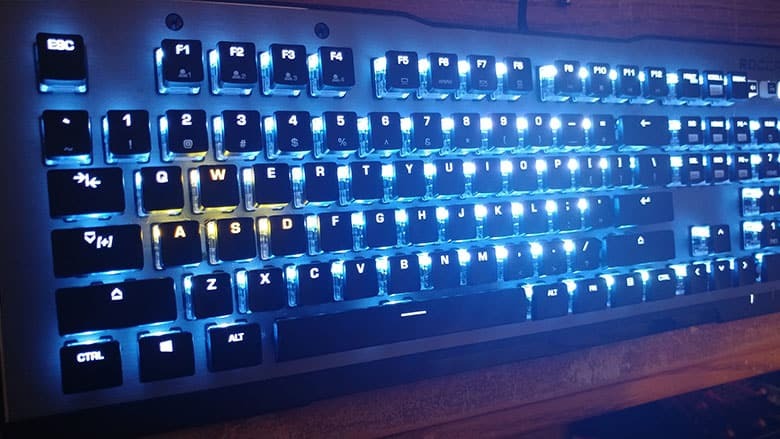 The first thing that just has to be said about the new Roccat Vulcan keyboard is that it looks absolutely stellar, thanks to a unique look and great lighting effects. I haven’t seen a keyboard released yet with this new type of design that makes each key look like it was individually placed, with noticeably smaller keys that look like they’re miles away from the keys that are next to it. When that’s paired with the grey anodized aluminum backdrop, it looks really clean and would make a great addition to any desk. As far as the Vulcan 100 AIMO’s lighting effects are concerned, there are some super cool effects available. First, there’s the default AIMO key illumination option, which is said to be an intelligent lighting system that reacts to how you use your keyboard. And, react it certainly does. In fact, if you hold one of the keys down, it looks like a plague, spreading color to the rest of the keys around it. You can also see the colors jump around as you type, reacting with color splashes as you type. There are other effects as well, including the standard wave effect, snake effect, fully lit, heartbeat 2.0, breathing 2.0, a fade FX (each key singularly illuminates as you press it), and a cool ripple FX with enough moving lights to give you the sense that you’re at an underground ’90s rave. There’s also a custom mode in the Swarm software that allows you to create your own light layouts, complete with effects. So, if you want your arrow keys to use the heartbeat effect but want the rest of your keyboard to use the breathing effect, you can easily set that up in the software. And best of all, you can create different custom layouts for each profile (meaning you can create multiple custom options). 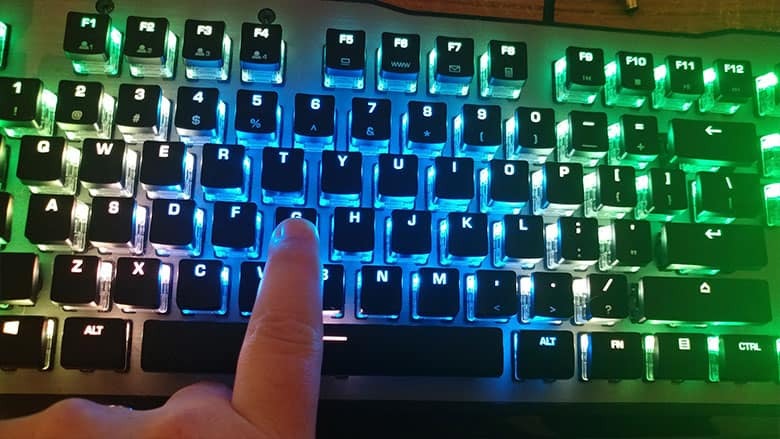 The second thing that Roccat is using to differentiate this keyboard from the numerous other gaming mechanical keyboards available right now is its unique proprietary switches called Titan switches. How do the Titan switches feel? They’re best described as a mix between brown and blue, with the feel that closer aligns with brown switches and noisiness that feels more like a blue switch. 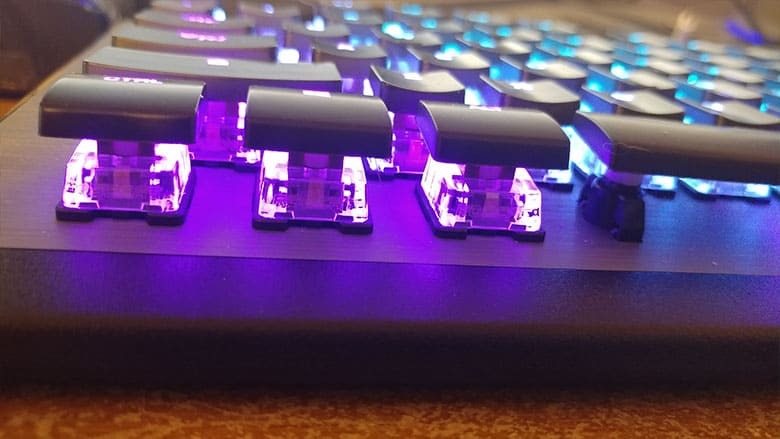 These Titan Switches are also dirt resistant and spill-proof, and because of the greater than average space between each key, the keyboard is much easier to clean. In fact, it’s the easiest keyboard to clean that I’ve ever used (which is big plus for those who spend hours at their desk every day). I’ll also note that the Roccat Swarm software does come with a real headscratcher of a feature that, for the life of me, I can’t imagine why anyone would use. It has to do with sound feedback and how your typing sounds. Essentially, what it does is allow you to set different sounds to your typing so that whenever you hit a key, the software also plays the sound. There is a standard click sound and a typewriter sound, but also a sci-fi laser sound and a beam. I can’t understand why anyone would want to use that while they’re typing — I even flipped it on while typing this sentence and it’s too much to bear any longer. There’s a novelty to it, sure, but that novelty fades quickly, and you’ll regret ever flipping any of those sounds on after typing just a few sentences, yourself. Overall, the Roccat Vulcan 100 AIMO has become our gaming keyboard of choice. While its price might be a little much for some, its quality is simply too high to ignore; you’re really getting what you pay for, here. With its unique design, great lighting effects, and good software that makes customizing it straight-forward, the Vulcan 100 AIMO gets the Nerd Much? seal of approval – it’s absolutely worth it. -Sound Effects Are a Dumb Idea, You Guys.